Carlson & Beauloye's Machine Shop is now part of Bender CCP. We are looking forward to continue serving customers in the San Diego area. "When A Man's Word And His Handshake Was The Best Contract Around." Back in 1924 the world was a simpler place. The pace of life was slower. Men took pride in the quality of their craft. An honest man could put in a full day's work and, at day's end, sit on the porch with his family knowing that he truly had earned his wages. It was a time when a man's word and his handshake was the best contract around. 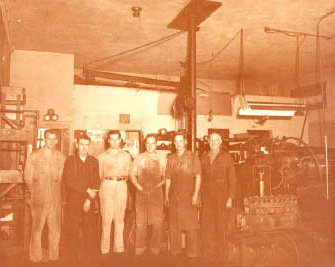 And, it was during that time that Carslon and Beauloye opened the doors of their first machine shop. The concept the partners had in mind was to offer San Diego businesses a source for "Quality workmanship and service at a fair price." As time passed, Carslon and Beauloye changed to keep pace with current business trends and practices. 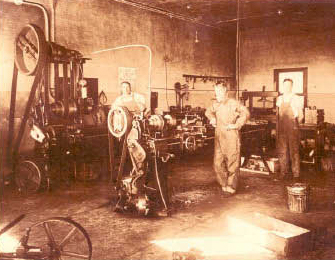 They maintained their general machine shop but expanded to manufacture a motorless water pump that generates its horsepower from water weight and gravity. If you would like more information on this product click on the gravi-check icon on this website. The company's expansion also saw the development of a machine now serving the food processing industry. The company expanded further opening a hard chrome plating department that specializes in repairing turbines and other high-speed equipment. This process is accomplished to Mil Spec Certification. In many cases this procedure has saved our customers, including the U.S. Navy, up to 90% of the cost of replacement equipment. Sensitive to the environment, the facility operates under negative air pressure through a state of the art air filtration system. The water and products used are all recycled. Carslon and Beauloye has a separate division that sells and services Air Compressors for the business and service sectors of San Diego County and Baja, California. The air power company has over 200 service contract including hospitals, health clinics and several local government facilities. Today Carslon and Beauloye remains a locally owned and operated company with the third generation of Beauloyes at its helm. Over the years many things have changed. The one constant for us is the pride of our original concept that we used to open the doors of our small machine shop so many years ago: "Quality workmanship and service at a fair price." Carlson and Beauloye adheres to and supports all State and Federal environmental laws and regulations. In addition, we recycle all plant process water. Our state of the art air filtration system creates negative air pressure while the air discharged through our Hepa-Filter System is cleaned of all contaminants to 99.99% or more than 30 times cleaner than allowable levels. Additionally, we use solar tube technology for clean, energy-conscious lighting. Carlson & Beauloye can meet air quality in accordance with ISO 8573-1 specifications. Lastly, we answer all of our phone calls with a live person during business hours. Call us at (619) 234-2256.